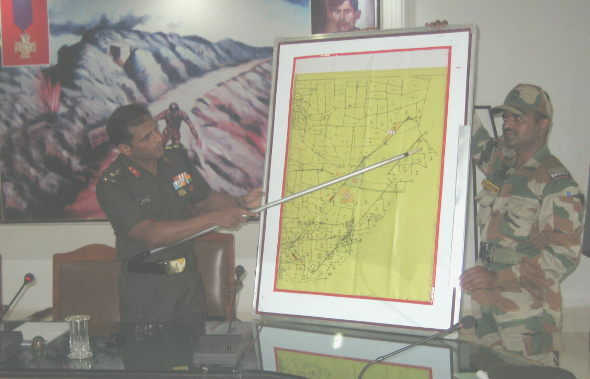 “There cannot be any compromise with the training at the Junior leaders wing at MLIRC and the wall around the Baghdad and Asmara firing range would be built for security reasons” said Brigadier Santosh Kurup today. In a press meet Brigadier said that, the Baghdad and Asmara firing range which encompasses 523 acres of land is very essential for the training and even the same range is utilized for joint military exercises of different countries as well. Karnataka State Govt on 24 May, 2000 issued a gazette notification RD 41LGL 98 and notified this land as a firing range. This is an A1 Defense land since 1908 and will be till 2020 as per the notification. The walls are being built around so that the property could be saved from intrusion and no roads are blocked permanently, only when there is firing exercise in progress the roads are blocked for security reasons. As the same is notified as a firing range until 2020, there is no scope of shifting the range from here, the Brigadier added. When asked about the Angadi college, he said as the matter was in the court he will not speak on the same. About 6500 acres of land which surrounds the firing range comes under the danger zone and hence no commercial activity can take place. He clarified farming can be done. I stand with Army…Mr Angadi’s interest is political only….